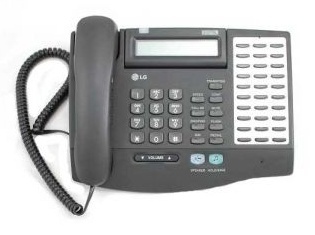 The LG LKD-30D system telephone is a digital, 30 button keyphone with speaker facility and LCD screen. It offers an excellent range of telephony features making it ideal for a variety of business uses. Display - an adjustable LCD screen displays useful information such as call duration, number dialled. Programmable Buttons - 30 buttons for the user to programme to suit their business needs. Caller ID - ISDN caller ID and intercom caller ID. Fixed Feature Buttons - these enable access to functions at the press of a single button. Flash - to terminate an outside call and return to the dialling tone without having to put the handset down. Speed - access to speed dialling, saved number redial and last number redial. Trans (Transfer) - to transfer an outside call from one user to another. Callbk (Callback) - when making a call to another user's handset that is busy, unattended or in Do Not Disturb mode this button leaves a callback indication. Conf (Conference) - to start a conference call. DND/Fwd (Do Not Disturb / Forward) - enables the user to forward calls to another destination or switch on their DND mode. Mute - used to switch the microphone on and off and works on both the handset and speakerphone. Mon/Speaker - this turns the phone on and off when using the speakerphone and enables on hook dialling, ie the user can make a call without lifting the handset. Hold - places an outside caller on hold. Volume - this enables the user to adjust the volume on the handset and on the speakerphone. Call Forward - a choice of options is available, follow me, unconditional, busy calls, no answer calls, station off-net, no answer DVU forward-1 (after 4 seconds), no answer DVU forward-2 (after predefined time) and busy DVU forward. Call Wait (Camp On) - user can alert a busy station to their call. Queuing - when a line is busy this enables a user to join a waiting list to use the line when it becomes available. Attendant Clock Set - allows the attendant to set the time and date without entering Admin Programming. Ringtone - choice of ringtones.